If the dropped ceiling in your home makes you feel as if you're living in an office, it's time for a change. You can upgrade to a better-looking tile, paint the tiles or choose another way to decorate your ceiling to give it a much-needed face-lift. For a softer ceiling with a romantic touch, drape soft, silky-looking fabrics. Spice up an ugly dropped ceiling with color or faux metal tiles. 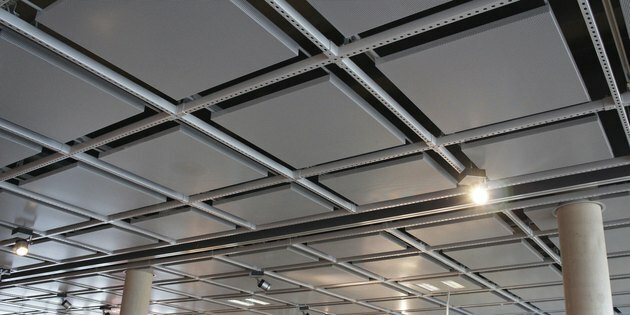 Multiple companies make faux metal ceiling panels that fit directly over the existing tiles in a dropped ceiling. Typically made from polyvinyl chloride and coated to give the tiles a metallic look, you can choose from tiles that look like tin, copper, bronze and other metals. The 2-by-2-foot tiles offer looks that rival Victorian tin tiles, Art Nouveau, Art Deco and even intricate lace doily patterns or geometric shapes. An inexpensive labor-intensive upgrade to ugly ceiling tiles is a simple sanding and paint job. You will need to remove the tiles from the grid and take them outside or to a well-ventilated space to sand and paint them. While you can certainly paint them by hand with a paintbrush or roller, a high-volume, low-pressure sprayer can complete the job in half the time. Choose a color that matches or complements the room's wall colors and decor scheme, or repaint the entire room, starting with the ceiling tiles. After removing the individual tiles, cut squares out of the desired fabric to fit the tiles, and then iron them flat. Apply an adhesive that works with the ceiling tile material and fabric to the tile face. Attach the fabric to the tile, working from the center out to avoid air bubbles. A handheld roller or even a kitchen rolling pin can help smooth the fabric onto the surface of the tiles. Replace the tiles when the glue dries. You can also cover them with wallpaper in the same way. The ceiling grid allows you to . Used white, military or colorful parachutes are a good source of material because they are large, light and silky fabrics that won't weigh that much when hung from the ceiling. Align the center of the parachute with the center of the room, or opt for different fabric pieces to hang like a circus tent from the center of the room to the corners.